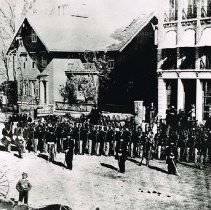 To Be Held at William Street United Methodist Church on Mar 21 at 7 p.m.
DELAWARE, Ohio – Anthony Gibbs, Manager of Local History Services at the Ohio History Connection, will reenact a civil war soldier from the 127th Ohio Volunteer Infantry at the next Delaware County Historical Society program entitled “Fighting for Freedom: The United States Colored Troops in the Civil War”. This program will be focused on the almost 200,000 black soldiers who fought for the Union during the war, and what made these men different from the other thousands who fought and died in the War Between the States. Many of the Colored troops from Ohio trained at Camp Delaware, near Delaware, Ohio. The program will begin at 7 p.m. on Thu., Mar. 21 at William Street United Methodist Church, 28 W William St in Delaware. Admission is free, but donations will be gratefully accepted. It is open to the public however due to the anticipated attendance, pre-registration is required. For more information and to register, visit DelawareOhioHistory.org and follow the links to Eventbrite, or call 740-369-3831, ext. 3, or email Programs@DelawareOhioHistory.org. Enter the church through the main entrance located off the city parking lot on Franklin Street. An elevator is available. Anthony Gibbs has traveled throughout the state of Ohio as a teaching artist and living history performer and has portrayed several key figures in American history. He is founder and Creative Director of Historic Impressions, an organization that seeks to create unforgettable experiences through significant stories from the past that give relevant, valuable insights for the present and the future.